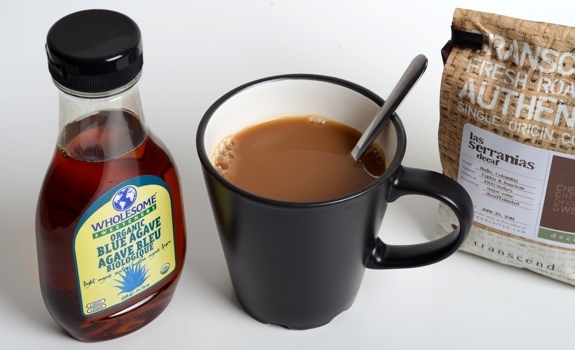 A bottle of organic blue agave nectar, which I've used to sweeten this tasty cup of Transcend coffee. When it comes to calories and coffee, it’s the extras that’ll get you. While coffee itself is almost calorie-neutral, the amount of milk and sugar you add can take a mug of brewed coffee from a handful of calories to more than 100. If you have a few mugs throughout the day, that splash of milk and two sugars adds up quickly. While I’m not as concerned about the milk, all that refined white sugar worries me more the older I get. I’d like to avoid diabetes or obesity issues, if at all possible. Now, don’t get me wrong. I like sugar, especially compared to things like high-fructose corn syrup, but I’d rather consume it in moderation, paring away sugar in places where it doesn’t need to be, and replacing it either with something without any sugar at all (water! ), or with alternative sweeteners. I’ve noticed organic blue agave nectar on counters at a few cafes in Edmonton – Elm Café has a bottle among the coffee condiments, as does the café at Planet Organic – so I did a bit of research and bought a little bottle to try at home. So, if you’ve never tried it in your coffee before, what can you expect? The Method: For the sake of comparison, I whipped up a mug of coffee with my usual sugar and milk, another mug with Wholesome Sweeteners blue agave “light” nectar and milk, and another mug with only coffee and milk, just so see what flavour each sweetener brought to the table. The coffee used was Transcend’s Las Serranias decaf, a sugar-cane processed decaf from Colombia. It is delicious. The Taste: Compared to the regular sugar, there’s some extra caramel taste in the coffee sweetened with blue agave syrup, as well as some bitterness and slight vegetal flavours. I was expecting the flavour difference to be stronger. The agave’s sweetness tastes smoother, versus the sharper, brighter sweetness of the white sugar. The more agave nectar you add, the more the flavour changes. Practical Coffee Consideration: It’s easier to measure two teaspoons of sugar than it is to judge the volume of agave nectar squeezed from a bottle. The Decision: I’ll be getting a bigger bottle of blue agave nectar to use in my coffee, and possibly for some baking experiments. The taste isn’t as strong as with something like brown sugar, maple syrup, honey, or any kind of molasses. Those all add a very distinctive flavour that interferes substantially with the taste of the coffee. As long as you go easy on it, the blue agave nectar is a bit more neutral. It sweetens without getting in the way. A small bottle of Wholesome Sweeteners blue agave “light” nectar. There are larger bottles for folks who use a lot of the stuff, or who want to save a bit of coin by buying in quantity. 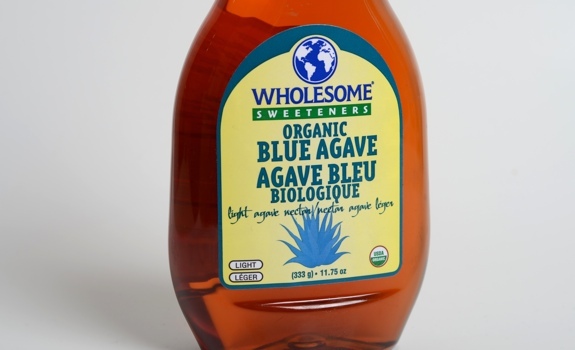 Cost: $6.69 for a 333-gram bottle of Wholesome Sweeteners brand organic blue agave nectar at Planet Organic. Value for cash money: Not great. Larger bottles are available, and that helps make the price per serving a bit more reasonable. Availability: Organic shops and health-food stores. If your grocery store has an organic section, check there. They may not have this brand, but they may have others. Nutrition? : 60 calories per tablespoon. Glycemic Index? : I honestly don’t know enough about Glycemic Index stuff to be able to offer any real insight. Just know that some folks like blue agave nectar because it offers a significantly lower GI value than, say, white sugar. That’s one big reason why people switch to it from regular sugar. The verdict: I still prefer the taste of regular sugar in my coffee, but this stuff is good enough to replace sugar on a frequent basis. Better than I expected it to be. I love Agave! Another use for it is as a pancake syrup. FYI Costco has the same product that you reviewed in a two pack which is much more reasonably priced than most other places. Pancake syrup, you say? Interesting. That would be good, though I’m sort of a diehard maple syrup kind of guy. I’m thinking of using the agave to make whole wheat bread. Good tip on the Costco availability, too. Thanks! I picked up a small squeeze-bottle of agave with a subtle organic hazelnut flavouring, awhile back. I’ve been making great pseudo-cafe au laits – coffee, a splash of dark chocolate Silk True Almond & then drizzle in a bit of agave as I’m frothing with my handheld frother(probably at least $4.25 for something like that at St*rbucks). The bread is a great idea! Could probably drizzle a bit on a bowl of fresh berries(like raspberries)or a fruit salad. If you’re looking to avoid the obesity and the diabetes, agave nectar might not be the way to go. Agave nectar is typically 90% fructose and 10% glucose. Fructose is metabolized the same way as alcohol is – in the liver, using the same metabolic pathways, minus the intoxication hit that alcohol gives us. What this means is that fructose is metabolized into fat in order to for the body to make use of it as energy in the form of triglycerides (those are one of the number you want to keep low on your cholesterol review). Excess fructose (much like excess alcohol, and meaning more than your liver can store as glycogen) precipitates into the liver as fat and can lead to fatty liver disease (alcoholic FLD in the case of alcohol, non-alcoholic FLD in the case of fructose). A fatty liver becomes less sensitive to insulin, and may kick off type-2 (insulin resistant) diabetes.